What our amazing customers have to say…. We experienced nothing but great service and friendliness from the moment we contacted them to book a boat hire, thru to walking off the pier at the end of the day. Everything you need for a safe and fun day on the ocean I did included, and optional extras are available from rods through to bait, and ice for the eskis. Clearly owned and operated by passionate people who care about giving great service and making their customers happy. First class operator and can not recommend highly enough! Very fast response time, extremely helpful and the whole team (Deb, Bre’ and especially Ryan) could not have done anymore to help. Whether it’s good reliable boats, fishing tips / locations, fishing equipment, great places to see or routes to take….. Airlie Boat Hire have the full service of expertise and are an incredibly nice and decent family run business! So much so, we rebooked the go again 2 days later. Do not look anywhere else for a first class experience! Many thanks Ryan and your team! David. Local family with plenty of local knowledge! Bob, Deb and Ryan were just amazing the deal with. I can’t believe how easy it was to book online, took only a second and when I called These guys were always ready to answer my 100 questions. Thank you Airlie Boat Hire for making our day out on the water one of the best experiences I’ve had. This is such a lovely family run business that really looks after their customers. I have hired boats from them many times and every time is such a pleasure! They really go out of their way to look after you and show you some good spots or helpful hints. Their boats are great! Well looked after and you can get around and see all the islands in a day! Would highly recommend Deb, Bob and Ryan if you are looking for boat hire in Airlie Beach. 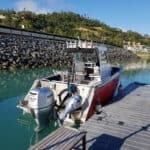 If you are looking for boat hire in Airlie beach this is the only company to hire from, their customer service is brilliant, nothing is too much trouble. We hired the pontoon boat and saw whales, dolphins, turtles we snorkeled and went to whitehaven beach. AMAZING… This was the best day of our holidays, Deb, Bob and Ryan were so helpful we will be back to hire from these guys again. We booked a tinnie but unfortunately we had to cancel due to not understanding that they were based on the mainland. Not based from Hamilton Island. My mistake… I spoke to Deb in the morning and she happily gave me a full refund on the day. They were very understanding about it and I know that next time I’ll use these guys to island hop around the Whitsundays. Very well run business. Formerly Boab boats, Airlie boat hire rates as one of the best activities in the Whitsudays. We hired a sports rider for the day and explored the islands around the Whitsudays in our own time, Whitehaven beach was amazing, would go again anytime. I can’t say enough about these guys, from booking to stepping on the boat the staff could not be more helpful. From snorkel gear to rods and bait all available did not have to bring a thing, didn’t even have to bring ice for the beer, they made our day out so easy. A lot companies could learn a lot about what service really is from these guys. Thanks again Bob, Deb and staff, we will be back! Wow what a business….professional and go that extra mile for you. The boats are perfect, had the best couple of days in the boat, out to whitehaven, chalkie beach for snorkeling and hamilton island for some tubing. 2nd day out to hook island and whale watching both days. This is why you need to hire boats from these guys the freedom you have to get around the whitsundays. Thank you so much Deb and Bob and Ryan for everything the family had the best time and a very memorable couple of days. These guys have a boat for everthing, a quick fish, a cruise arround or the pontoon for that big family day or a bunch of friends, could not recommend them highly enough! Deb, Bob and Ryan are very professional and friendly, they helped me out with choosing the right boat for my trip, gave an easy to understand run down of the electronics and features of the boat and even shared local location, weather and conditions information. Airlie boat hire is the complete package, with great people, service and advice. I highly recommend them!